Agriculture has been big business in Pennsylvania since before European settlement. The present state’s fertile plains and farmland provide ample opportunities for growing crops and raising livestock. The most recent survey of agriculture in PA, conducted in 2012, identified a total of 59,309 farms spread out across 7,704,444 acres statewide. Major industries include dairy production, corn, wheat, oats, and soy. Pennsylvania also leads the country in Agaricus mushroom farming and ranks highly as a producer of apples, Christmas trees, and grapes. Like many businesses today, Pennsylvania’s agriculture producers face a need to do more with less. Smaller profit margins make it critical to keep overhead expenses to a minimum. One way to do this is by making smart investments in renewable energy that reduce your dependence on fossil fuels. In many respects, farms and dairy producers are ideal candidates for solar power. Large clear lots make it easy to maximize exposure to the sun. Panels can be mounted to the roof of a barn or outbuilding, ensuring they don’t take up farmable land. Best of all, solar energy is virtually maintenance-free — an essential benefit for farmers who already work a long day and don’t want to worry about additional service requirements. Cost savings: The sun is an endlessly available source of free energy. 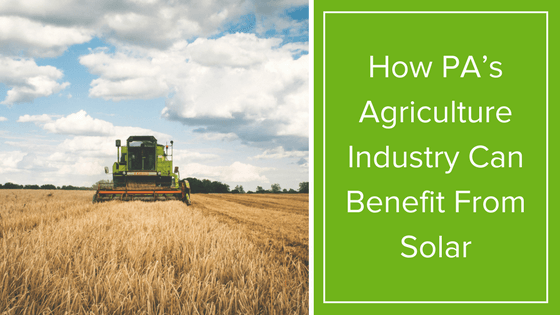 While your path to an ROI will be contingent on various factors, most agricultural solar installations pay for themselves within a few years. After that, you’ll enjoy free energy for as long as you need it — a typical solar installation can be counted on for 30 or more years of service. If solar isn’t powering your farm entirely, it can still offset your reliance on the grid and serve as a hedge against rising fuel costs that makes budgeting more predictable on a month-to-month basis. Future planning: There’s also a larger, more philosophical benefit to agricultural solar. As someone who makes their living off the land, you understand the importance of protecting it for future generations. If the effects of climate change are to proceed unchecked, it’s likely to be the agricultural industry that suffers the most. Unpredictable weather and severe droughts will make it harder to make a living and, eventually, threaten the very sustainability of the food system. Switching to renewable energy is a small but significant step you can take to secure a better future for everyone. Ready to get started? Contact Bright Eye Solar to arrange a free energy audit and learn about options for going solar on your property. Do I Need a Building Permit to Add Solar Panels to My Home? A Brief History of Solar Energy in the U.S. Solar Panels for Businesses — What’s the Benefit? Will My Solar Panels Produce Enough Energy in the Winter? Can Your Business Save Big With Solar?